Chelsea striker Olivier Giroud has hinted he could be interested in joining Ligue 1 club Lyon at the end of the season. Giroud has only started six Premier League games under Maurizio Sarri this term, scoring just once, but he has thrived in the Europa League. The France international hit a hat-trick in a 5-0 away win against Dynamo Kiev last week to book Chelsea's place in the quarter-finals. 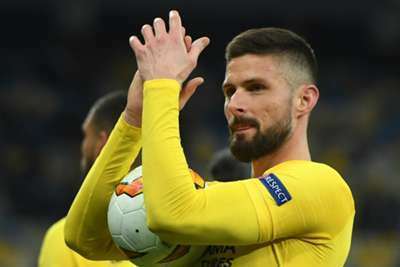 Giroud's nine goals is more than any player in this season's Europa League but he was back on the bench for Sunday's 2-0 Premier League loss at Everton. Lyon president Jean-Michel Aulas has named Giroud as a transfer target and the 32-year-old suggested he could be keen on the move. "I can imagine a return to France. We do not know what the future will hold," he said in an interview with Progress. "This is not my priority at the moment, but I will be open to all proposals because I am happy when I play. "I am very happy with the interest of some French clubs. Lyon was mentioned because the president talked about it. "It's a club with very good young people, very good players, a very good staff. Lyon is a very good club, a great team, like others in France."